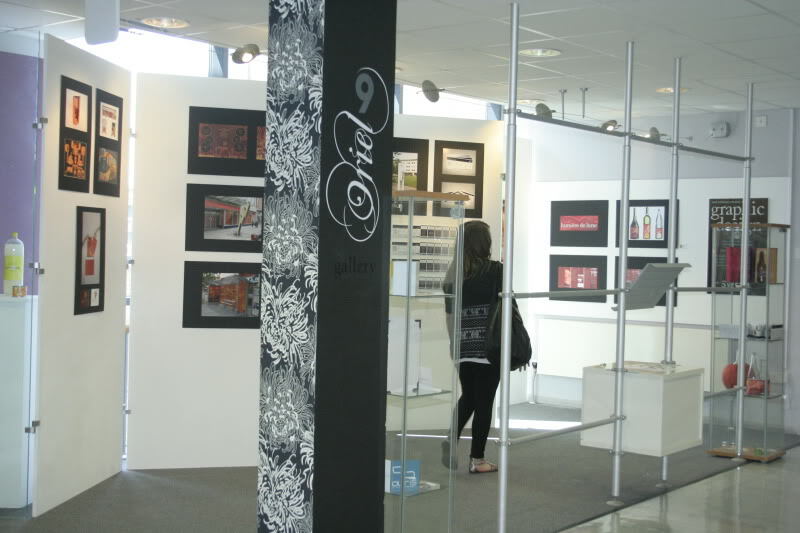 Final Major Project was the last project of my BTEC National Diploma in Graphic Design course, and took place over 8 weeks. For the project we had to write our own brief; deciding on a theme, final outcomes and an essay topic. 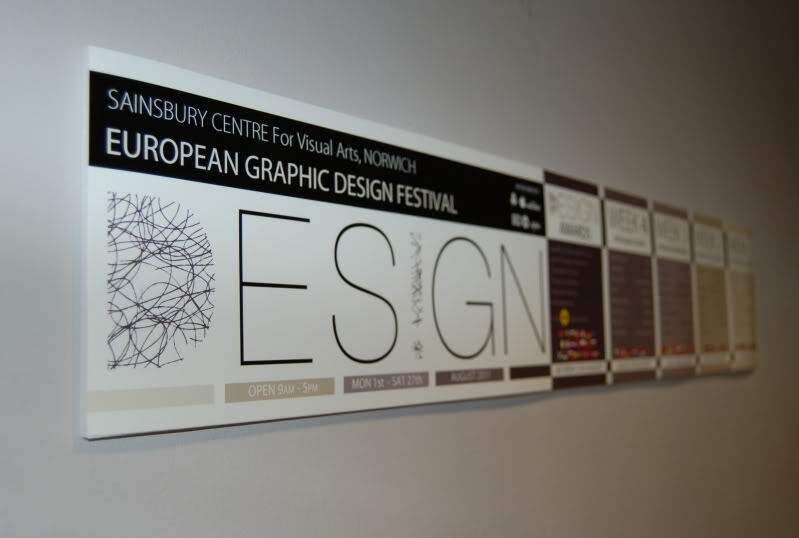 I chose to undertake designing and organising a Graphic Design festival, complete with exhibitions, speakers, workshops and an awards ceremony. 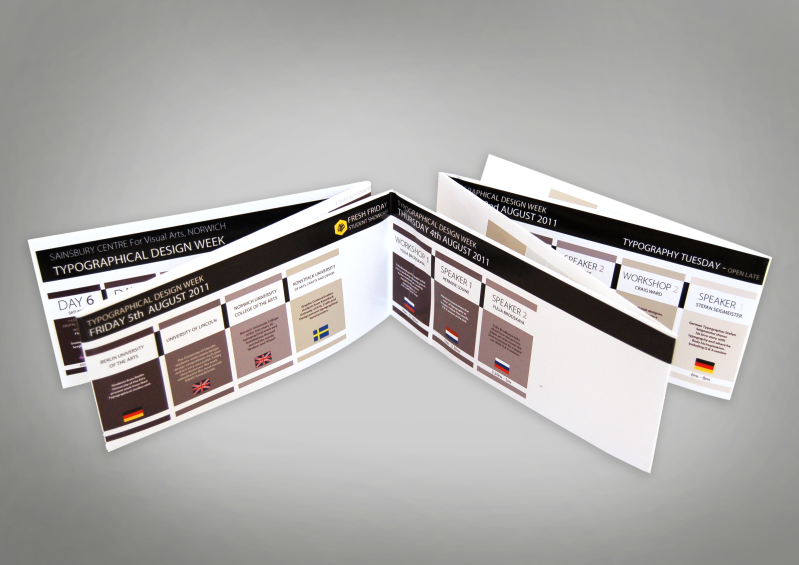 I decided my final outcomes would be 5 posters – 1 poster per week and then 1 poster for the overall festival, 2 programmes, 4 tickets and development for a website and awards ceremony. 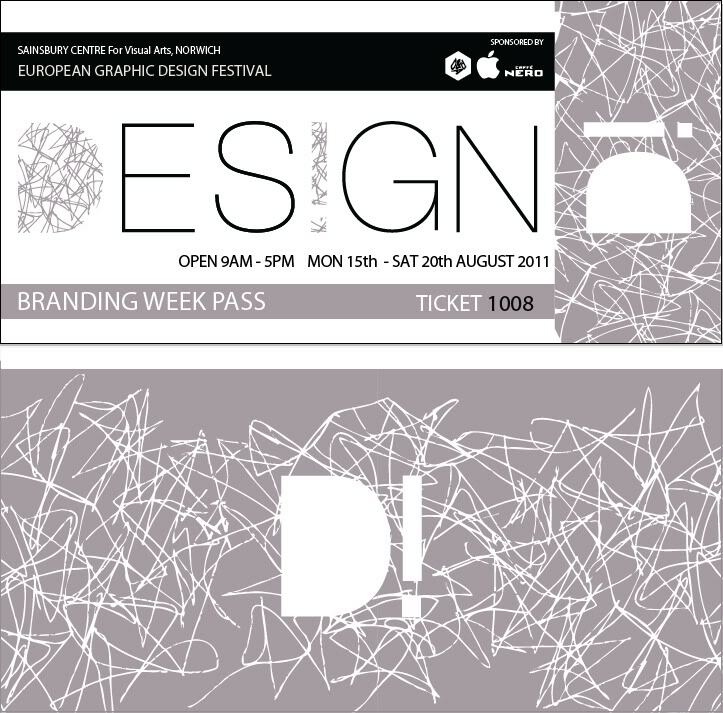 After looking at 45 Design Festivals worldwide, I decided on a name; DES!GN. 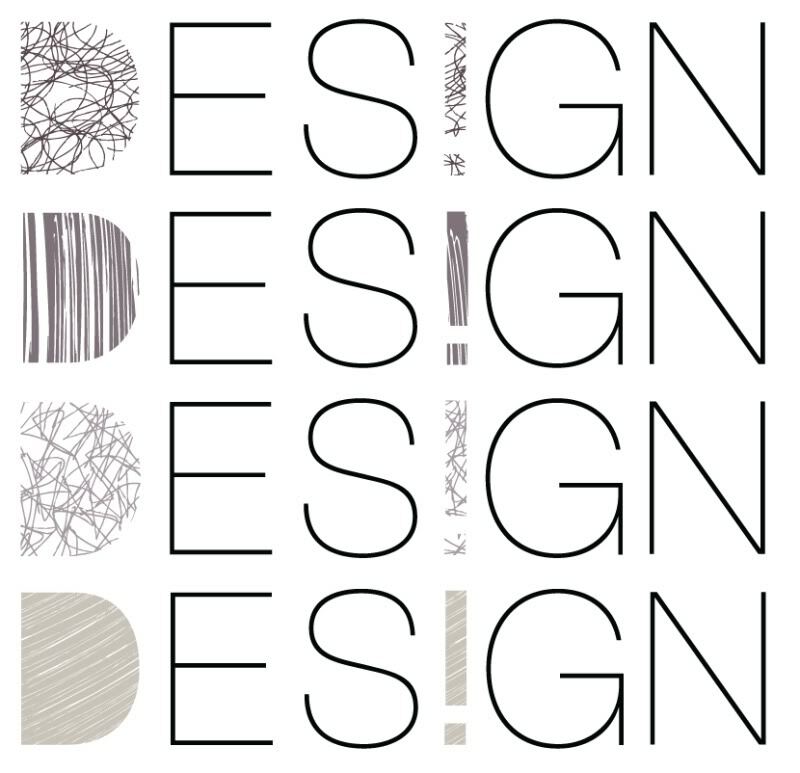 I then designed a logo, which turned into a logo which changed every week to create weekly identities. The thinking behind the scribble patterns is that designers usually start with hand drawn sketches and ideas and then move on to more polished designs on screen. A lot of creative people doodle while thinking and sketching ideas, so I wanted to play on this. Another reason is that I wanted my festival to stand out from the rest, which all use very clean typography, and so used a mix of stylish Helvetica with a pinch of creativeness. 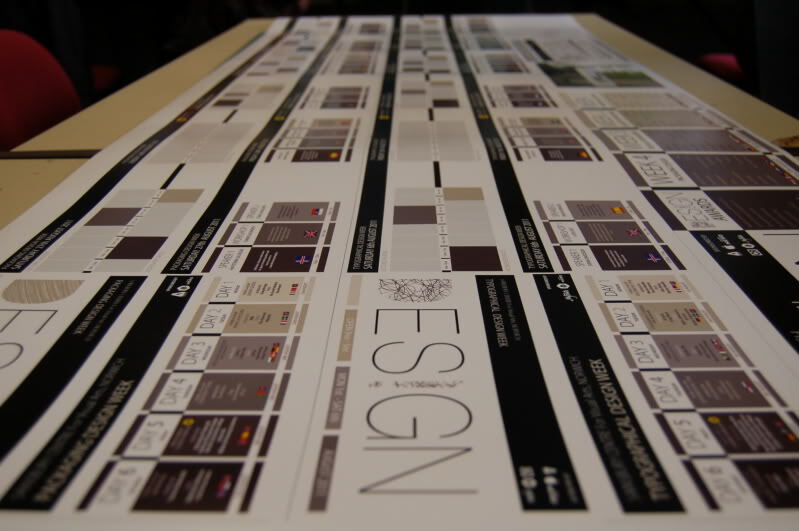 … for my posters I adopted a Pantone swatch style using warm/purpley greys. You may think oh, it’s just a poster with some Graphic Designer’s names on but infact I treated this project as if the festival was actually happening. I researched over 80 artists/designers, selected a venue based on certain requirements, hand picked designers for the final line up (I didn’t just do eenie meenie miini mo! 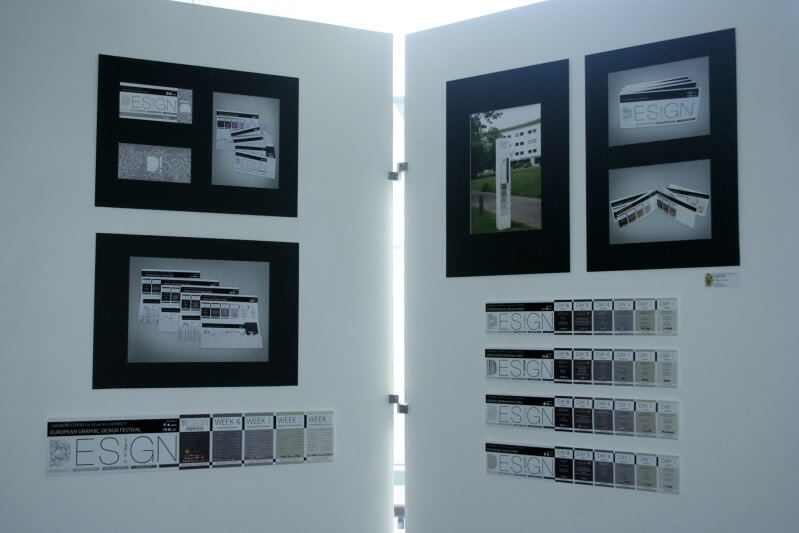 ), devised room plans and timetables for all 4 weeks – it took a lot of paracetamol! I wanted to keep the branding of the festival consistent so used the same style from the posters for the tickets and ticket holders. I even created colour co-ordinating envelopes for specific weeks with the D! detail stamped on the back so that the envelope would stand out amongst the other letters in a bundle of post. 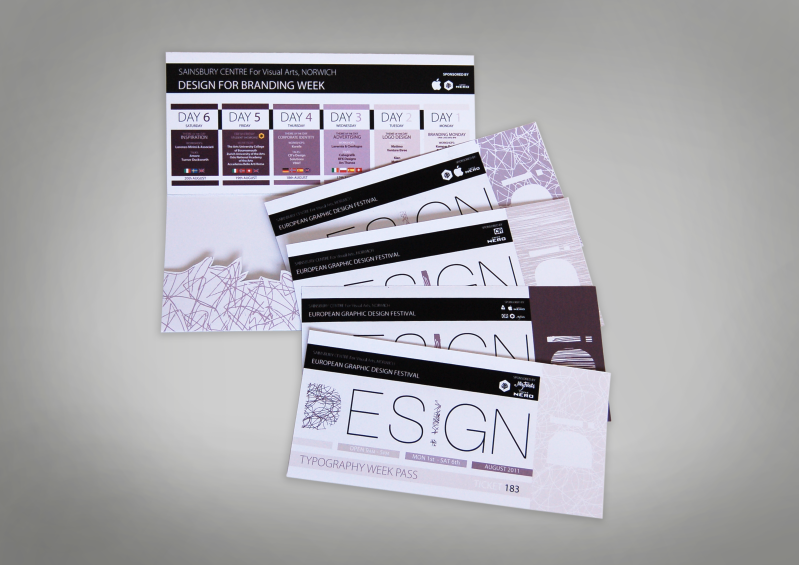 Each week has a different ticket, ticket holder and envelope using the same grey/purple colours and scribble patterns throughout. I had to edit all of the text on the timetables so that it was legible, which meant A LOT of test prints and tweaking but it was worth it in the end. The tweaks made were all of the things that nobody will notice now, because they help the design work, but were the things that would have been pointed out if I had left them as they were. 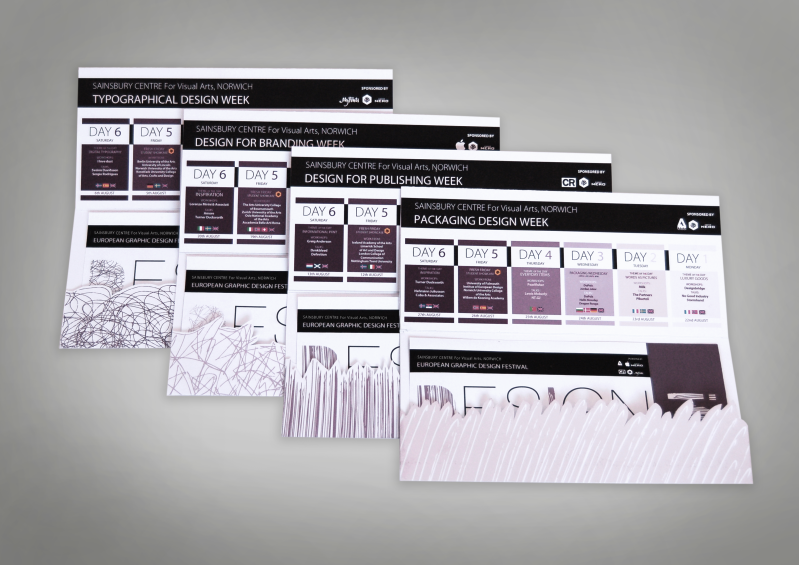 I also designed 2 programmes – 1 for Typographical Design Week and 1 for Packaging Design Week. 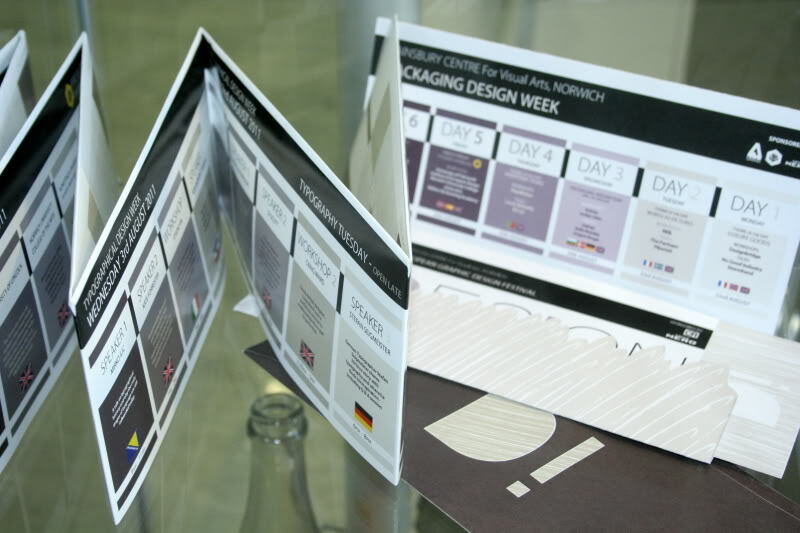 Each programme is double sided, with one side containing the 6 day’s details about the speakers/workshops and the other contains a diagram to help visitors see the speaker/workshop overlaps etc. But anyway, I scored and folded them to the shape…. … and a programme was born. 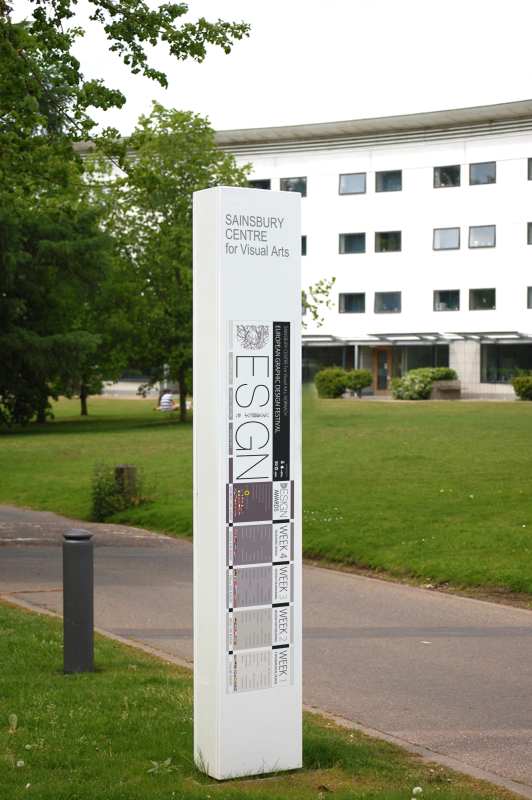 I also edited the festival line up onto a SAINSBURY CENTRE For Visual Arts sign post…. 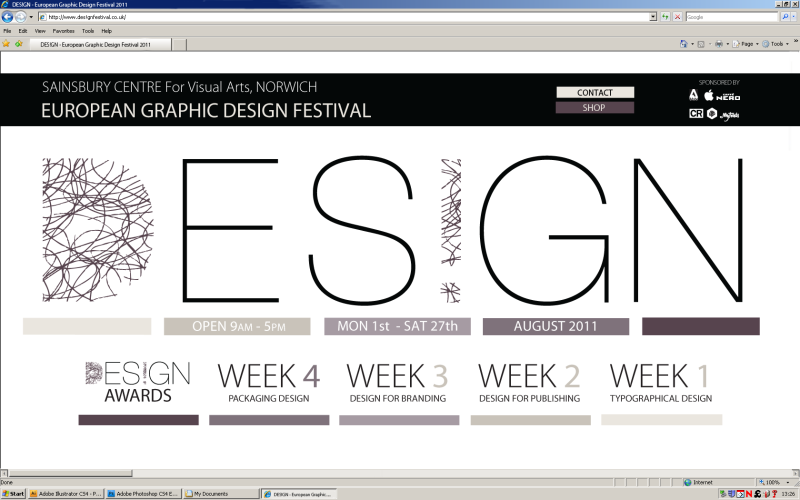 I opted for a really wide style web page, with a scroll bar at the bottom. 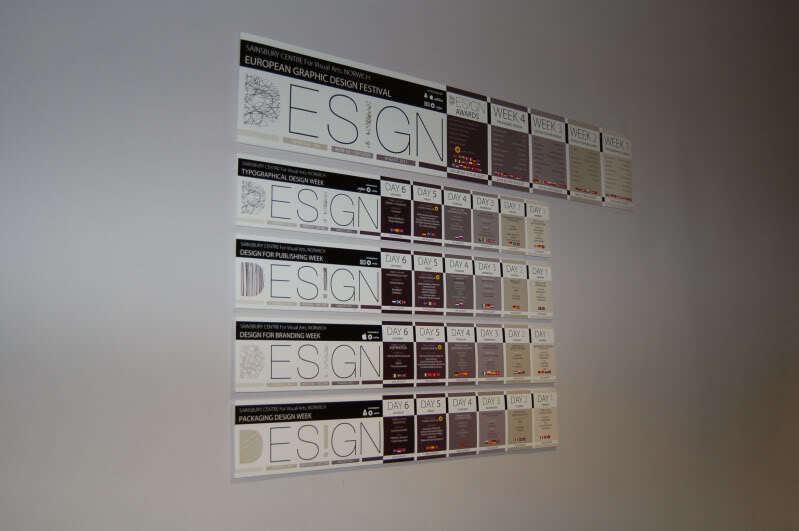 This meant that the information could be displayed like the posters. 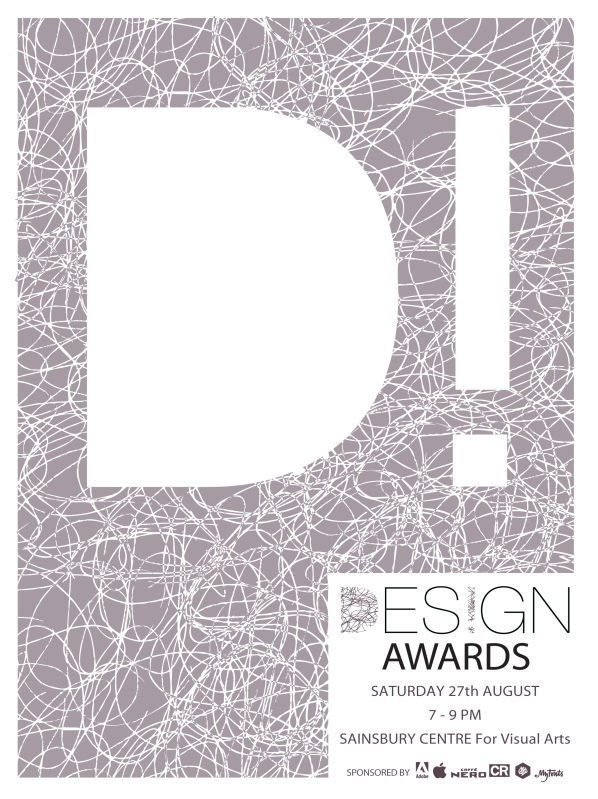 I wanted to create a design which used the key elements of the festival’s design, but create a separate identity for the design awards in a way. And how was it exhibited? I didn’t want to mount my posters because they would have been really tiny, so printed them off at actual size and stuck them on foam board. All in all, I am pleased with the way my project turned out. I didn’t know what to expect and couldn’t imagine what my final would be like but I am glad I did the DES!GN Festival. 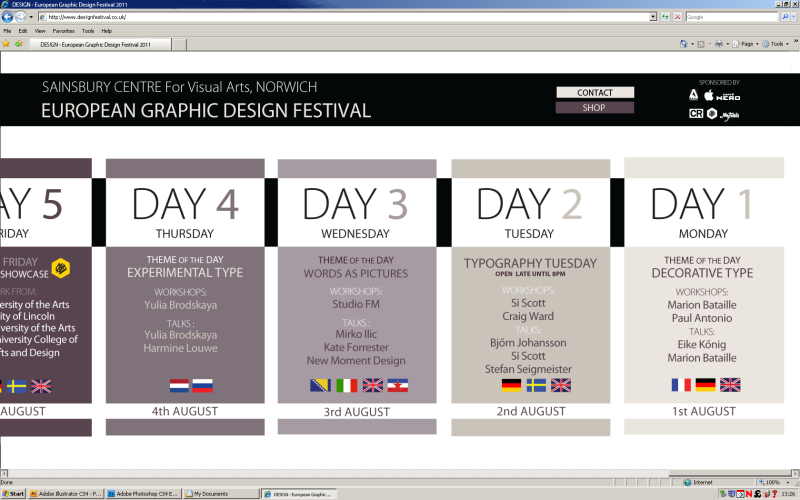 I have learnt a lot, not just about planning, typography and the software but about European Graphic Design too. I now feel more knowledgable and could drop a few more names into conversation! Tomorrow is doom day. Results! And although I technically don’t need to get any specific grades to get into Uni (my offer conditions are that I just complete the course :P) I am still hoping for the best grades possible…. I know everyone wants the top, but I have been aiming towards that since the start of the course and I always set myself a challenge! We shall see tomorrow! At the end of the day, I am pleased and very proud of what I have achieved and I am going to Uni so although I will cry, I will be happy with whatever grades I get. Afterall it will be only what I deserve! I’m taking the tissues tomorrow anyway…! Please comment on this post! PLEASE! I want to know what you think! Just stumbled across this via searching ‘scribble’ in google images. Love the project and the concept behind it. 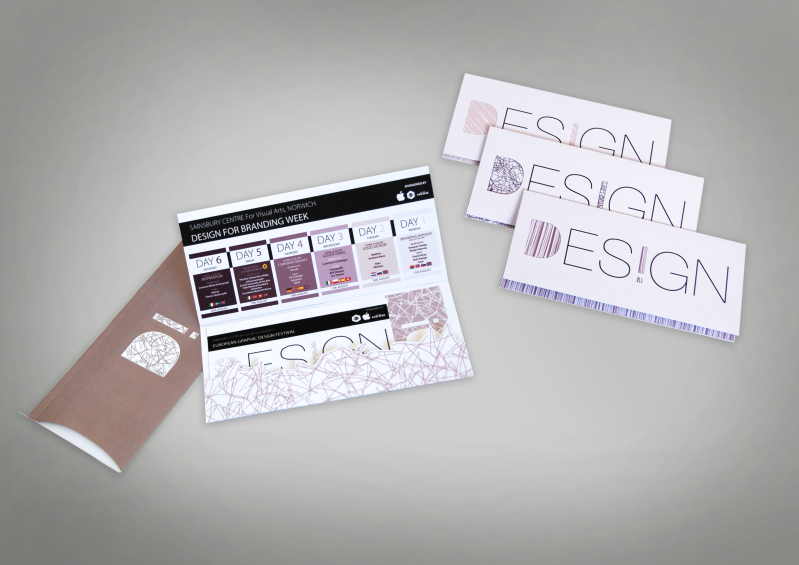 It’s really nice to see ideas executed well and this project embodies that. Good luck on your degree course and enjoy it!